The future of city driving—at least in theory—sounds amazing. We’ll have digital assistants in our vehicles to book last-minute restaurant reservations, and we’ll never have to touch a steering wheel again because our cars will drive themselves. At CES, I got a glimpse of how this technology is coming along, and though it was in the context of a carefully designed demo rather than a real-life experience on the city streets, I walked away thinking that a driverless society is a long, long time away. My big realization came during a self-driving car experience that was put together by six big companies: Microsoft, NXP, IAV, Swiss Re, Esri, and Cubic Telecom. The ride-along was pitched as a demonstration for how future vehicles will communicate with infrastructure like street lights and rely heavily on artificial intelligence to give people like me—a tourist in an unfamiliar town—a fully automated cruise around an unfamiliar city and suggest places to visit. The concept was freaking awesome, and I should have had a great time taking the tour. I was supposed to jump in the car and have it drive me down the Las Vegas Strip as the AI system pointed out a bunch of interesting locations that I could potentially visit. Best of all, I wouldn’t have to do anything because the car was supposed to be autonomous. I imagined it would be like the perfect cab ride, without a chatty driver or any errant turns. My car ride would actually be used to get things done, like learning about the city I was visiting or making new plans on the fly. But the reality is that the self-driving technology barely worked at all, and the internet-connected systems appeared to be faked by the demo car. In the end, we almost crashed—twice! And I felt this wan’t too much to expect. Google’s been developing self-driving cars and testing them in the real world almost without incident for years. And last year, Uber launched its first fleet of fully-autonomous cabs in Pittsburgh. 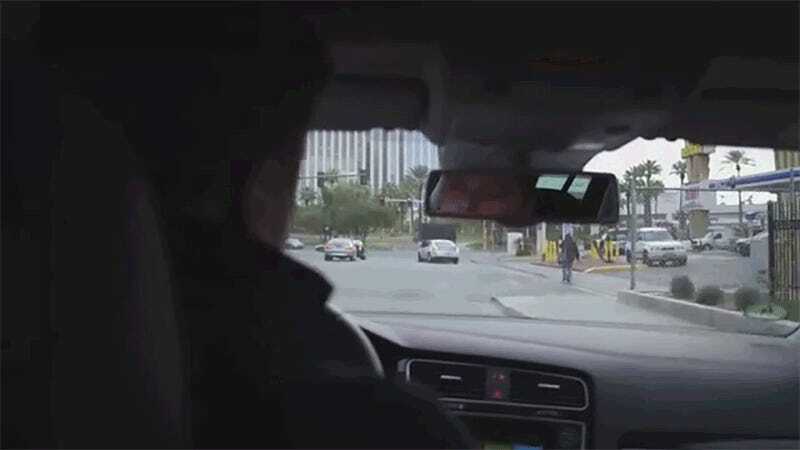 Sure there is still a driver sitting in the passenger seat of those Ubers, but for the most part, they’re driving themselves with real-life humans in the backseat. And in terms of production vehicles, Tesla cars are equipped with full-autonomous hardware, and they even have a (legally onerous) autopilot system. Still, while safe self-driving cars might exist in some capacity today, my demo didn’t make me feel good about the technology. In the end, we almost crashed—twice! On two different occasions the car failed to stop, and our driver had to slam on the brakes to prevent the vehicle from slamming into another. Apparently, the system has difficulty identifying stationary vehicles. OK! Moreover, our car operator manually drove for at least 40 percent of the total ride. He turned the wheel and hit the brakes. On a couple of occasions, he didn’t respond to the AI system even though it was operating like he did. It was like being locked in a roving prison cell with a marketing guru who kept yammering about the internet of things and a mystical future of vehicles. To be fair, the companies explicitly stated beforehand that this was just a concept vehicle and it was meant to demonstrate what would someday be possible. To the credit of the six companies that built this thing, there were a lot of moving pieces, and they put it together in only six months. The vehicle we rode in was a modified Volkswagon Golf Estate with an unbelievable amount of extra technology hardwired into it, including vehicle-to-everything (V2X) systems, radar, a camera, LiDar, and 4G LTE connectivity. It was a hell of a lot more hardware than you’d find in even the most advanced driver-assistance cars on the market—like a Tesla—and together it should have provided a smooth ride around the city. But there were a few barriers we weren’t able to overcome. First of all, in order for a car to communicate with the street lights, the city needs to be equipped with its own V2X communications systems. That basically means that the street lights and other intersections need to have a small box that looks like a wireless router that can send information to the vehicle. On the route we took on the Las Vegas Strip, there was only one intersection that had the necessary V2X system—and I’m pretty sure it didn’t work properly. It was hard to tell when our driver was using the foot brake, but I know for sure he had to brake at least twice during our “autonomous” part of the trip. That wasn’t the only communications problem we hit. Our car’s infotainment system was controlled by Microsoft’s digital assistant Cortana, and it was able to do a lot of the same things you’d be able to do on a Windows 10 computer. It could search nearby local businesses, make appointments to your calendar, and accomplish a variety of tasks through voice command. The only weird part was that Cortana seemed to launch randomly throughout our ride (video at the bottom of this post). I wasn’t able to confirm it, but I would not be surprised if the infotainment system was just playing some sort of Cortana video in order to fake the demonstration. Our interaction with Cortana was strange to say the least, especially since we never really called upon it whenever it launched. Still, I have to admit, it really made me want a digital assistant in any car that I buy in the future. Self-driving cars aren’t exactly ready for prime time yet, and after today, it’s clear to me that technology companies (and the cities they operate in) don’t have all the pieces to make it happen. The LiDar and radar systems that detect the world around the car are far from perfect, and the city communication systems are even worse. We’re going to need much, much better versions of all these things if autonomous vehicles are ever going to be mainstream—but I still have hope that in 10 years when I come back to CES, I’ll be able to happily report that I toured the city in a car that doesn’t need an operator.